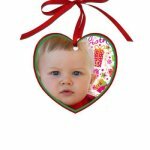 Good to give any time of year, our optic crystal ornaments with personalized message are the perfect small gift. Choose from either our clipped-corner rectangular shape or diamond shape, measurements listed below. Each comes with a silver string for hanging, blue-foiled presentation box, and up to 50 characters engraved. Characters will appear as frosted white against clear background. Place desired shape in cart to order online, specify text, and select in-store pickup or other shipping method. You know how flat ornaments always seem to hang with the backside facing out? We have the solution! 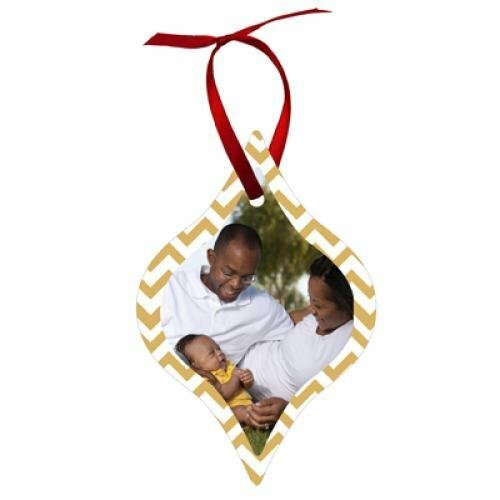 Our customizable double-sided ornaments can feature your favorite photos, artwork, or saying on both sides, so it doesn't matter what side is showing. 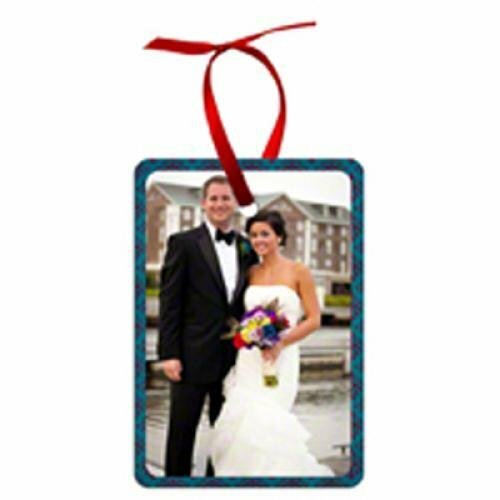 Commemorate a special event with photo on one side and text details on the other, use as gift tags with to/from info on one side and a meaningful message on the other, or incorporate your decorating scheme into one-of-a-kind miniature pieces of art. Each piece is 3.5" x 3.75" paw-shaped, crafted from double-sided white sublimatable aluminum and includes red hanging ribbon. Price includes full-color imprint on both sides with submittal of high-definition photos and/or graphics at time of order. Please see Artwork File Formats for acceptable formats. Or select from any of the Options available during checkout to select from our pre-loaded backgrounds, sayings, and/or fonts. Just explain what you want in the Special Instructions box (for example, picture of kids uploaded on front, candy cane background and Merry Christmas in Elf Script font on back). You know how flat ornaments always seem to hang with the backside facing out? We have the solution! 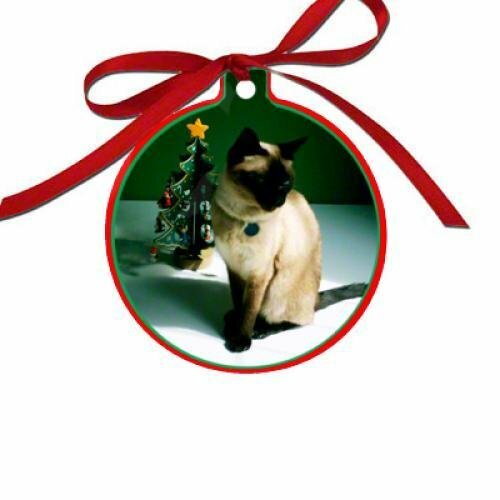 Our customizable double-sided ornaments can feature your favorite photos, artwork, or saying on both sides, so it doesn't matter what side is showing. 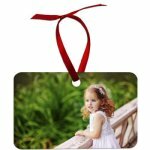 Commemorate a special event with photo on one side and text details on the other, use as gift tags with to/from info on one side and a meaningful message on the other, or incorporate your decorating scheme into one-of-a-kind miniature pieces of art. Each piece is 2" x 3", crafted from double-sided white sublimatable aluminum and includes red hanging ribbon. Choose from vertical or horizontal format. You know how flat ornaments always seem to hang with the backside facing out? We have the solution! 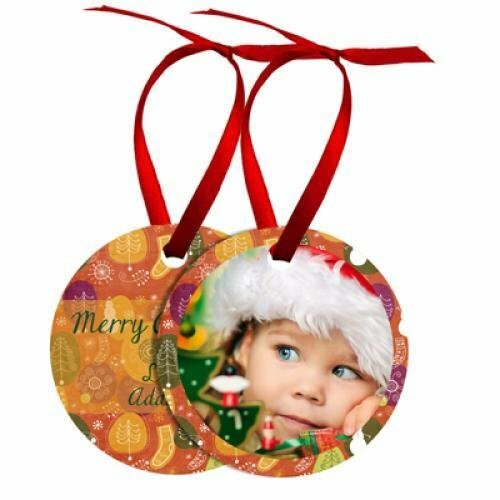 Our customizable double-sided ornaments can feature your favorite photos, artwork, or saying on both sides, so it doesn't matter what side is showing. Commemorate a special event with photo on one side and text details on the other, use as gift tags with to/from info on one side and a meaningful message on the other, or incorporate your decorating scheme into one-of-a-kind miniature pieces of art. 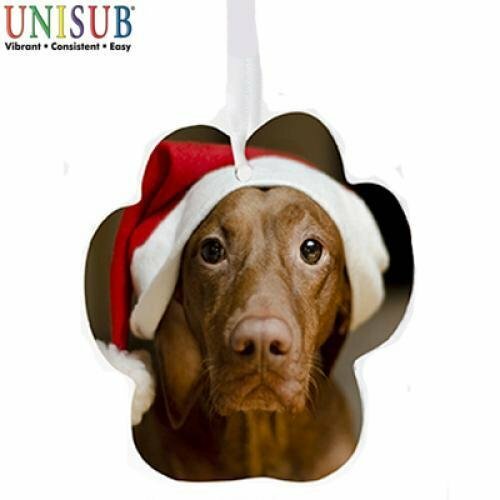 Each piece is crafted from double-sided white sublimatable aluminum and includes red hanging ribbon. Choose from different shapes/sizes below. Taper Shape, 2.5" x 4.0"
Square Scallop, 3.0" x 3.0"
Heart Shape, 2.75" x 3.0"
Good to give any time of year, these clear glass ornaments, each approximately 2" x 2" are the perfect small gift with personalized message. Each comes in red velvet bag and box for wrapping and includes up to 50 characters engraved. Characters will appear as frosted white against clear background.